This is a HP DL380 G5 2u Rackmount Server, though we don't have the mounting brackets for it. (440886-425). Rack-mountable - 2U. Server Scalability. 2 x HP NC373i. HP Smart Buy. Power Redundancy. Form Factor. Product Dl380 Proliant G5 Server. HP SERVER DL380 PROLIANT G4 2 X XEON E5450 3.0GHZ 4.0GB 584GB 371293-405 2U RAC. HP SERVER DL360 PROLIANT G6 2 X XEON QUAD CORE E5530 2.4GHZ 4.0GB 584GB 519568-4. 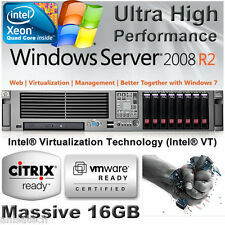 DELL SERVER R7610 PRECISION 1 XEON QUAD CORE E5 - 2603 1.8GHZ 8.0GB 512GB SSD. HP DL380 G5 Motherboard And 2U Rackmount Case Only. Strictly just the case and motherboard only. Used = An item that has previously been used. Condition = Used. Item Features. Item Accessories. Item Condition. There are no HDDs included with this unit. Dual network cards. HP Proliant DL380 G5 Server. Condition is Used. Collection in person only. HP ProLiant ML370 G5. HP ProLiant ML370 G5 Base. HP ProLiant ML370 G5 Entry. HP ProLiant ML370 G5 Performance. HP ProLiant DL380 G5. HP ProLiant DL380 G5 Base. HP ProLiant DL380 G5 Entry. HP ProLiant DL380 G5 High Performance. 2x QUAD-CORE 3.16Ghz 64-bit Processor ( 2x Installed) Xeon X5460 12M cache. 5X 72GB hard drives, (approx. raw capacity of about 300gb). 64Gb ram pc2-5300f. it all depends if you got the expertise and resources. HP Proliant DL380 G5 -2U Server- 2x 2.83Ghz Quad core (Total 8 Cores). HP ProLiant DL380 G5 takes #1 2P performance spot on Siebel CRM Release 8.0 Benchmark Industry Applications running Windows! The HP ProLiant DL380 G5 holds the #1 result for 2 socket performance on Siebel CRM Release 8.0 Benchmark Industry Applications running Microsoft Windows with 5,200 users. 394035-001 HP Proliant DL380 G5 DL385 G2 System Fans complete set. Condition is Seller refurbished. Dispatched with Royal Mail Signed For® 2nd Class. Processor -2 x Xeon 5150 Dual Core 2.66GHz. Hard Drive - None included. Optical Drive - DVD. HP Proliant DL380 G5 Rack Server. Credit or Debit Card accepted Worldwide. All refurbished hard drives are data wiped to NCSC standards. Proliant DL380 G5 Special Rack Server. Dual Xeon quad core 2.83 processors installed. 4 x 72Gb SAS 15k drives (hot plug). HP Smart Array P400 RAID card. New RAID battery. Dual Power Supplies. HP ProLiant DL380 G5 takes #1 2P performance spot on Siebel CRM Release 8.0 Benchmark Industry Applications running Windows! The HP ProLiant DL380 G5 holds the #1 result for 2 socket performance on Siebel CRM Release 8.0 Benchmark Industry Applications running Microsoft Windows with 5,200 users. HP Proliant DL380 G5 -2U Server- 2x 3.00Ghz Quad core (Total 8 Cores). HP ProLiant DL380 G5 takes #1 2P performance spot on Siebel CRM Release 8.0 Benchmark Industry Applications running Windows! The HP ProLiant DL380 G5 holds the #1 result for 2 socket performance on Siebel CRM Release 8.0 Benchmark Industry Applications running Microsoft Windows with 5,200 users. Model: ProLiant DL380 G5. Motherboard: 013096-001. HP DL380 G5 2x Quad Core Xeon E5440 Processors 16GB RAM & 5.4TB 4Gbit Fibre Channel Storage. All you need to do is connect the 5.4TB 15K Storage to the DL380 G5 Server using the Fibre Cable. Then boot the server to either Windows or Linux and you'll see all 12x HP 450GB 15K Fibre Channel Hard Drives. (RAID0 146GB) 2 x 72GB SAS 10K rpm 2.5" Hot swap, Dual Embedded Gigabit NICs. 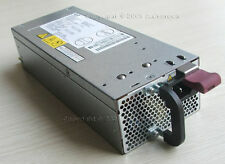 Internal Drive Support: 2 x HP 72GB SAS 10K rpm 2.5" Hot swap (RAID0 146GB). HP Proliant DL380 G5 -2U Server- 2 x 2.33Ghz Quad core (Total 8 Cores). 8 x 72GB 6G 15K SAS Drives (in Raid 5). 2 x Xeon Quad-Core 3.00 GHz/133 2x 6MB L2. So this is a HP ML380 G3 specs as follows. 2 x hot swap power supplies. Smart Array P400 / 256Mb. 3 x 146GB SAS HDD included. 8 x 2.5" SAS Drives bay -. Embedded Dual Gigabit Ethernet. DVD-ROM Drive. 2x Redundant Power Supplies. 1 Power cable. Smart Array P400 / 256Mb. 8 x 2.5" SAS Drives bay - NO HDD included. 32Gb RAM (4GB x8). 2x Redundant Power Supplies. DVD-ROM Drive. HP Proliant DL380 G5 Server. All works. Any questions please ask. Model No: Proliant Dl380 G5. 1 xHP Proliant DL380 G5 Server. 1 x HP SC11XE Single Channel 68Pin PCI-E X4 LVD Ultra320 SCSI Host Bus Adapter Card - 439946-001. 1 x HP SC08Ge Host Bus Adapter Card - 489103-001. Total Storage 584GB. HP SERVER DL380 PROLIANT G4 2 X XEON E5450 3.0GHZ 4.0GB 584GB 371293-405 2U RAC. HP SERVER DL360 PROLIANT G6 2 X XEON QUAD CORE E5530 2.4GHZ 4.0GB 584GB 519568-4. Product Proliant Dl380 G5 2u Rack Server. HP Proliant DL380 G5 -2U Server- 1x 2.33Ghz Quad core (Total 4 Cores). HP ProLiant DL380 G5 takes #1 2P performance spot on Siebel CRM Release 8.0 Benchmark Industry Applications running Windows! The HP ProLiant DL380 G5 holds the #1 result for 2 socket performance on Siebel CRM Release 8.0 Benchmark Industry Applications running Microsoft Windows with 5,200 users. Internal Drive Support: 2x 72GB SAS 10K SFF SP 2.5" HP HOT PLUG drive cage ( 6 Blanks drive cage fitted ). HP Proliant DL380 G5 -2U Server- 2x 2.66Ghz Quad core (Total 8 Cores). HP ProLiant DL380 G5 takes #1 2P performance spot on Siebel CRM Release 8.0 Benchmark Industry Applications running Windows! 2 x 73Gb 10k 2.5" SAS hot plug hard drives. HP ProLiant DL3 8 0 G5 Dual Core XEON 1U Rack Mount Server. Rack Mount Rails. Dual Gigabit Ethernet. In good condition and in full working order. And all other standard specification. NEW AND BOXED HP DL380 Proliant G5 E5405 Server REGULATORY PART NO: HSTNS-1023 INCLUDES RAIL KIT (PART NO: 360322-503) RRP IS £499.99 UK POSTAGE ONLY PAYMENT VIA PAYPAL PLEASE. WILL REDUCE PRICE FOR COLLECTION OF ITEM. RAID Level: RAID 0, RAID 1, RAID 10, RAID 5. Manufacturer: HP. Onboard Graphics Processor: ATI ES1000. 2 (total) / 0 (free) x CPU. Product Form Factor: Rack-mountable - 2U. Depth: 26 in. Weight: 44.97 lbs. 4 x 73Gb 15 k 2.5" SAS hot plug hard drives. HP ProLiant DL3 8 0 G5 Dual Core XEON 1U Rack Mount Server. Rack Mount Rails. Dual Gigabit Ethernet. 2 x 80 0w Power Supplies. And all other standard specification. 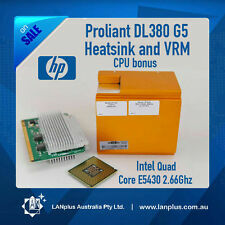 Dual Core Processor Heatsink VRM Module included. HP Proliant DL380 G5 -2U Server- 2x 2.66Ghz Quad core (Total 8 Cores). HP ProLiant DL380 G5 takes #1 2P performance spot on Siebel CRM Release 8.0 Benchmark Industry Applications running Windows! The HP ProLiant DL380 G5 holds the #1 result for 2 socket performance on Siebel CRM Release 8.0 Benchmark Industry Applications running Microsoft Windows with 5,200 users. HP Proliant DL380 G5 Server 16Gb Ram 2xQuad core 3.0Ghz Xeon Processors P400 Smart RAID Array controller with battery backup and 256MB Ram DVD-RW drive 8xDrive Caddies 2x1 TB HDD installed Fantastic server VM ware capable, great for home use etc. there is no OS installed on the system it is formatted and ready for you to put on whatever you want. Comes with a small flatscreen monitor ideal for configuring the server. Any questions please ask. Collection preferred - note if collected cash on collection only. If shipped will be well packaged and insured hence the high cost. 1 x HP ProLiant DL380 G5 Server. HP ProLiant DL380 G5 2x Xeon Quad-Core 5320 1.86GHz 546GB. Storage: 546GB. Model No: ProLiant DL380 G5. 32GB RAID 2U Server. 3 x 146GB 2.5" SAS 6G DP 15K HDD - 512744-001. Quad-Core XEON E5405 2.0Ghz Processor. Rack mount rails. In good condition, tested and in full working order. all other standard spec. Quad-Core XEON E5405 2.0Ghz 12Mb cache 1333 FSB Processor. Rack mount rails. all other standard spec. (New Arrival. Internal Drive Support: 8 x Blanks drive cage fitted ). In good working order with Server 2008 R2 installed. Includes rack rails and has 6 network ports. HP ProLiant DL380 G5 2U Rack Server. Rack mount rails. In good condition, tested and in full working order. Both Processors installed. HP ProLiant DL380 G5 2U Rack Server. Rack mount rails. all other standard spec. Both Processors installed. HP Proliant DL380 G5 Server. 1 x HP Proliant DL380 G5. 3 x 2.5" 146GB, 10K SAS Hard Drives - 5 x 2.5" SAS Bays Empty. 1GB x 4 = 4GB RAM.